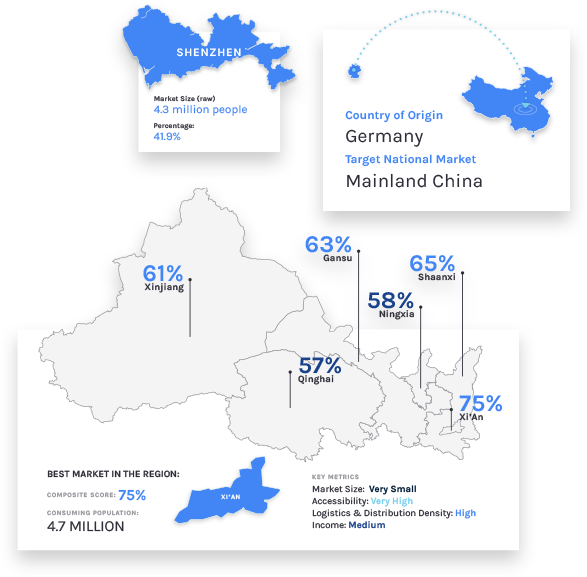 Our Target Market Analysis makes it easy for you to decide where to sell your wine, beer, or liquor in China. Your ideal target customer and audience, including demographic information, purchasing habits and other important characteristics. We offer 3 types of target market analysis—Essential, Core, and Complete, ranging from simple and focused to detailed and all-encompassing. Whether you are looking to start in a single local market or have long-term expansion plans, we have the solution for you. See the features available with each solution and choose the one that best fits your needs. *This includes product affordability analysis for 3 markets if for Mainland China or Taiwan and 2 if for Hong Kong or Macau. ***This includes detailed Local Market Profiles for 5 markets if for Mainland China or Taiwan and up to 3 if for Hong Kong or Macau.